A modern, superior type of fine art print called "giclees"
Giclees (pronounced "SHE-clays") are a relatively new form of archival quality fine art prints. This topic can be complicated because of the variations that are possible in fine art. The term "giclee" is a French term meaning "spray of ink", as the inkjet printers spray millions of tiny drops of ink onto a substrate. The term "giclee" distinguishes high end, archival, fine art inkjet prints from ordinary inkjet prints, just as "serigraph" distinguishes high end, archival, fine art silkscreen prints from ordinary, commercial silkscreen prints. Giclees can be scanned reproductions of existing art such as paintings or drawings, or they can original giclees. "Original giclees" in this context means that the art has not been reproduced from art that exists in another medium, such as a painting or drawing. • sometimes printed on other substrates such as aluminum. Prints on canvas are commonly referred to as canvas giclees, giclee canvas, canvas prints and giclees of canvas. Giclees – whether they're on canvas, paper or aluminum – are the best form of art print available today. They are generally superior to older print media such as serigraphy, lithography and etching because those older media may require require use of toxic materials, are inefficient to produce and therefore are usually more expensive, and might not give all artists the looks that they want. Giclees are appreciated by collectors for their fidelity and quality, and desired by galleries and artists alike because they don't have to be produced in huge quantities with their large layout of capital and storage. Giclees can be printed either directly from digital files, or from scanned digital scans of the artist's paintings, thereby saving generations of detail-robbing negatives and printing plates used with traditional lithography printing. My giclees are high-resolution, archival art prints, which I print slowly and laboriously – one at a time – using archival, fade-resistant inks on acid-free paper and archival giclee canvas. I like giclees because the inks and substrates are archival, and some of the colors are richer than the colors I can get from acrylic or oil paints. (One of the compliments I hear repeatedly is that people love the vibrant colors in my prints). During my digital enhancement of my reproduction giclees before printing, I'm able to boost the vibrancy of the colors so that the reproductions are more bright and vibrant than the original paintings are. I also varnish each print by hand, using the best archival varnish on the market. I inspect each print to check for flaws before numbering and signing the print. I print and fill in the accompanying certificate of authenticity. 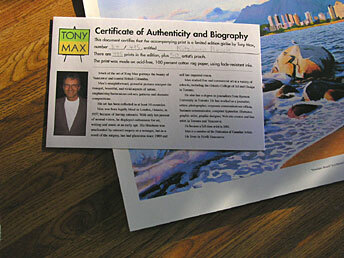 I print the the prints and their corresponding certificates of authenticity to the public. Flawed prints that cannot be fixed (about 10 percent of all prints printed) are cut into pieces and recycled, ensuring consistent, high quality throughout the edition, but adding to the cost of production and reducing my profit. I cull the prints to ensure the highest quality for my customers. For canvas prints, I sign each one the front, and record the title, size, dimensions and number on the back. I control every aspect of the printing, thus ensuring that the quality of my prints is maximized. Giclee printing – contrary to popular misconception – is not mass production. There is a significant element of hand-crafting and individual attention involved for each art print, and I am involved in every stage of production of my giclees. It is a slow process. Each print is printed individually and painstakingly. Some people confuse giclee printing with offset lithography – the process used to print books, magazines. and brochures. Offset lithography is used for big-run printing; all of the prints in a print run are printed at once, whereas giclees are printed painstakingly one at a time on big, archival inkjet printers, and there's much attention given to each individual print. The people whom I've encountered who criticize giclees for their quality were all people who aren't giclee artists and had no idea of what giclees are. They were ignorant of even the basics of giclee craftsmanship. I have turned down requests to relinquish control of my printing to other companies, even though I might have made more money by releasing control. I don't want other people diluting the quality of my prints. And the major giclee publishers are not known for varnishing giclees they publish. Lack of varnishing makes the giclees susceptible to scratches, moisture damage and premature fading. I meticulously record in my books the history of each of the prints: first documenting the fact that the print has been printed and that it is therefore part of the inventory, and after the print has been sold, the selling date, and the name of the buyer are also recorded, so each print has its history recorded. Properly made giclees are archival and last far longer than than offset lithographs. Giclees should not be exhibited for extended times in direct sunlight. Exhibition in lower light is preferable to prolong image permanence. Beware of art prints that appear to be giclees but which are actually canvas transfers, meaning offset lithographs that have had their ink transferred onto canvas. They are a cheap imitation of canvas giclees, but don't last long because the offset lithographic inks aren't archival. Giclee printing allows for more vibrant colors and a broader color gamut than mass production offset lithography because most of the giclee printers use seven to twelve ink colors instead of the four colors normally used in offset lithography, and the inks are long-lasting pigmented inks rather than dye-based inks. Giclees are expensive to print because of the high cost of equipment and materials used, and the amount of care required to hand-craft these archival prints one at a time. Some people incorrectly refer to my prints as photographs. The prints are giclees – not photographs. Photographs are images – especially positive prints – that are recorded by a camera and reproduced on a photosensitive surface – exposing a light-sensitive substrate such as paper to light. Giclees (pronounced she-clays) on the other hand are images produced by spraying a fine spray of electrically charged particles of ink onto a substrate (usually canvas and sometimes paper or metal plates) using an array of ink dispensed from approximately seven to 12 ink cartridges mounted in the printer. Many inkjet printers are called "photo printers", but technically, the name is misleading because of the differences I described in the last two paragraphs. Basically, photos are made in cameras (and in the past in darkrooms), by exposing a light-sensitive material to light, whereas inkjet are made by spraying ink onto a substrate. I sign all of my canvas art prints. For the canvas prints, I publish descriptive information on the edges of the canvases, outside of the image areas. (For stretched canvas prints, the information becomes wrapped around the backs of the prints.) The information includes the print's title, size i. e. (small, medium, or large), dimensions, edition publishing date, Tony Max copyright statement and the Tony Max Web site address. If you plan to get one of my canvas prints stretched by a picture framer, ask the staff not to cut off that print information.